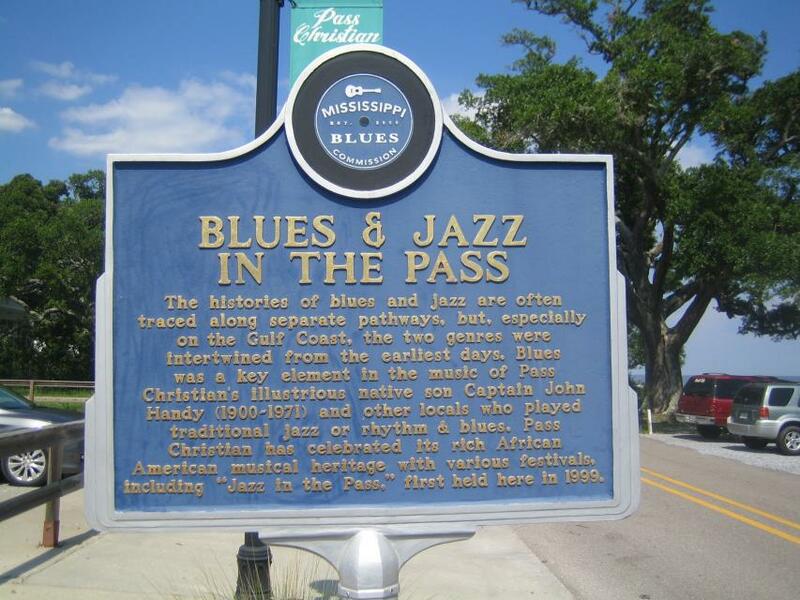 The histories of blues and jazz are often traced along separate pathways, but, especially on the Gulf Coast, the two genres were intertwined from the earliest days. 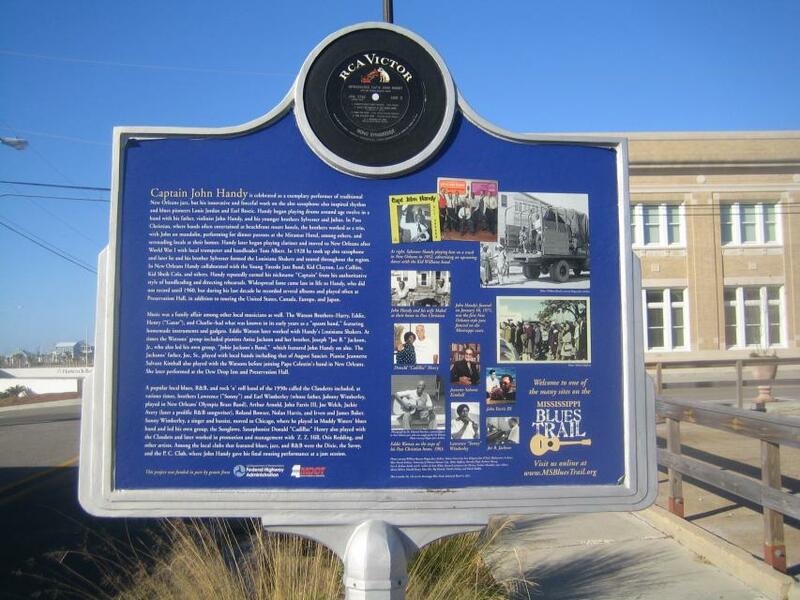 Blues was a key element in the music of Pass Christian's illustrious native son Captain John Handy (1900-1971) and other locals who played traditional jazz or rhythm & blues. Pass Christian has celebrated its rich African American musical heritage with various festivals, including "Jazz in the Pass," first held here in 1999. Captain John Handy is celebrated as a exemplary performer of traditional New Orleans jazz, but his innovative and forceful work on the alto saxophone also inspired rhythm and blues pioneers Louis Jordan and Earl Bostic. Handy began playing drums around age twelve in a band with his father, violinist John Handy, and his younger brothers Sylvester and Julius. In Pass Christian, where bands often entertained at beachfront resort hotels, the brothers worked as a trio, with John on mandolin, performing for dinner patrons at the Miramar Hotel, among others, and serenading locals at their homes. Handy later began playing clarinet and moved to New Orleans after World War I with local trumpeter and bandleader Tom Albert. In 1928 he took up alto saxophone and later he and his brother Sylvester formed the Louisiana Shakers and toured throughout the region. In New Orleans Handy collaborated with the Young Tuxedo Jazz Band, Kid Clayton, Lee Collins, Kid Sheik Cola, and others. Handy reputedly earned his nickname "Captain" from his authoritative style of bandleading and directing rehearsals. Widespread fame came late in life to Handy, who did not record until 1960, but during his last decade he recorded several albums and played often at Preservation Hall, in addition to touring the United States, Canada, Europe, and Japan. Music was a family affair among other local musicians as well. The Watson Brothers-Harry, Eddie, Henry ("Gator"), and Charlie-had what was known in its early years as a "spasm band," featuring homemade instruments and gadgets. Eddie Watson later worked with Handy's Louisiana Shakers. At times the Watsons' group included pianists Anita Jackson and her brother, Joseph "Joe B." Jackson, Jr., who also led his own group, "Jobie Jackson's Band," which featured John Handy on alto. The Jacksons' father, Joe, Sr., played with local bands including that of August Saucier. Pianist Jeannette Salvant Kimball also played with the Watsons before joining Papa Celestin's band in New Orleans. She later performed at the Dew Drop Inn and Preservation Hall. A popular local blues, R&B, and rock 'n' roll band of the 1950s called the Claudetts included, at various times, brothers Lawrence ("Sonny") and Earl Wimberley (whose father, Johnny Wimberley, played in New Orleans' Olympia Brass Band), Arthur Arnold, John Farris III, Joe Welch, Jackie Avery (later a prolific R&B songwriter), Roland Bowser, Nolan Harris, and Irven and James Baker. Sonny Wimberley, a singer and bassist, moved to Chicago, where he played in Muddy Waters' blues band and led his own group, the Sunglows. Saxophonist Donald "Cadillac" Henry also played with the Claudets and later worked in promotion and management with Z. Z. Hill, Otis Redding, and other artists. Among the local clubs that featured blues, jazz, and R&B were the Dixie, the Savoy, and the P. C. Club, where John Handy gave his final rousing performance at a jam session. This marker can also be identified by its HM code. You can use the hashtag #HM1JA2 in tweets, and any other place where you might refer to this marker, including when searching on this site.